Our food favourites were the Beef Fajita Gyros; the Spanakopita and Baklava made by Serano Bakery; and the ridiculously good Gyros (not pictured) from Messini that we had on Sunday. We had such a good time on the Danforth — and shockingly, my health actually allowed it — that we returned the following day with our dogs, Javier and Cachita. I knew we’d have our hands full with the dogs, (especially with Cachita being blind), so I didn’t take any photos on the second day. Javier is motivated by food and there’s nothing he won’t do for food, so as we expected, it was incredibly amusing to watch him run from booth to booth, going crazy smelling all the food in the air. He was in heaven! 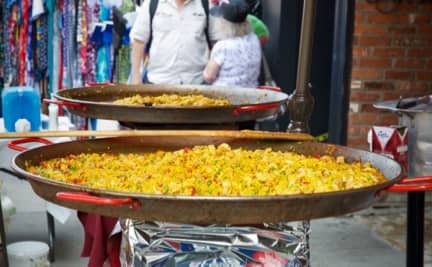 Plus, we shared some food with him every time we got something, so he quickly understood the concept of a street food festival. We were constantly taking the dogs to a parkette or even just to some nearby shade in order to take a break from the sweltering heat, but as soon as Javier was finished eating he was up on his feet and ready to go back for more. He knows how to butter people up and how to pose just the right way to look extra cute, so whenever he saw someone with food in their hands that happened to notice him, he sat down nicely, twisted his head ever so slightly, and fluttered his eyelashes to try to look as cute as possible so that people would want to feed him. Just imagine what a cartoon dog would do at a food festival, and that was Javier. He’s also quite the scavenger though, so we had to watch him like a hawk to make sure he wasn’t eating too much garbage off the street. (There’s only so much you can do.) That Sunday was clearly all about him. 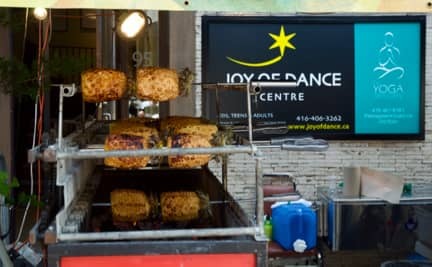 You can see more photos from the Danforth in my post, Taste of the Danforth 2011. 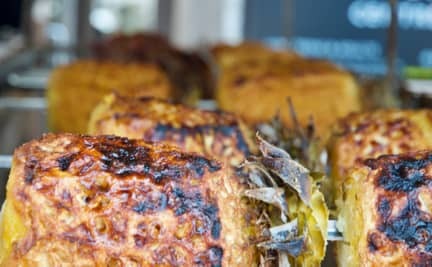 Taste of the Danforth 2018 was published by Daniel Menjívar on August 18, 2018 at 2:05:24 PM EDT and last updated on April 18, 2019 at 4:41:29 PM UTC .